Spend the day sailing around the paradisiacal island of Boracay on this small-group tour from Kalibo. 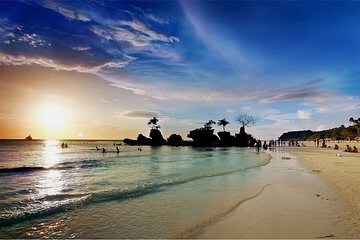 Sail along the coast of Boracay with a maximum of 16 guests and stop at picturesque beaches and snorkel spots throughout the day. Enjoy a delicious lunch and dinner buffet of local and international cuisines included in the price of the tour. I found the trip a waste of my day. It should have been a 2 hour boat ride around the island and that's all. A separate trip for those that like to snorkel to give them more time. We got taken to an island where there were rocks and the beach was murky - what's the point when the beach at the hotel is 10 times better. The lunch was very ordinary and we didn't bother with the dinner. There needs to be a restructure to suite the different options.